What could be a better summer dessert than sweet corn pound cake? I love fresh, sweet corn. I spent some of my childhood in New Jersey and never quite got over my love for that Jersey sweet corn. Where we lived we were surrounded by farms… and there was nothing that I liked better than when my mom quickly pulled over to the side of the road and bought a big basket of corn. That meant one thing… Corn for dinner! Corn, good fresh corn, has a flavor that is reminiscent of vanilla. 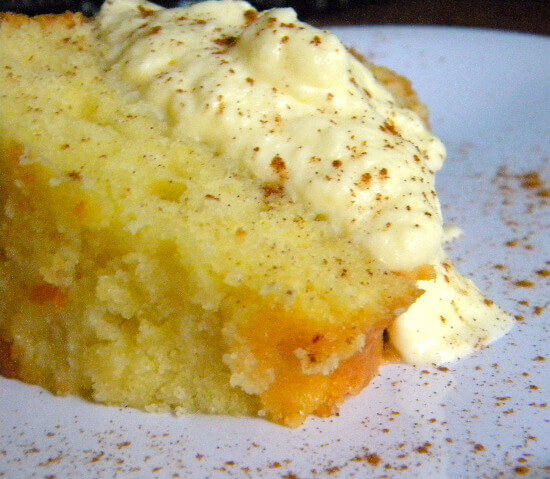 I wanted to get that flavor in a cake but I didn’t want the grainy texture of cornmeal. I had an idea for a sweet corn pound cake that had a delicate, complex flavor that could be eaten plain or used as a base for fruit and sauces. This sounds more complex than it is. It really isn’t difficult and it is worth the time it takes to make the corn milk. Sweet corn pound cake would be an awesome dessert to serve for Labor Day, say goodbye to Summer with this cake and maybe some grilled peaches or pears. Take it into Fall with a maple glaze… Really, this is so wonderful and yet so basic that you will come up with a myriad of ways to use it. Because I was testing this recipe I decided to keep it simple with a honey flavored whipped cream. Corn and honey are a classic combo as far as I am concerned. It works really well in this but maple flavored whipped cream or maple glaze would be equally delicious. 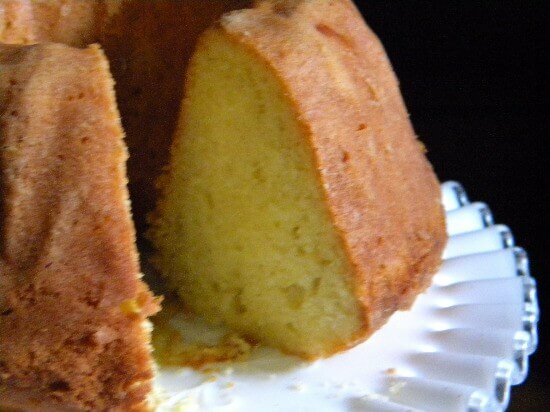 If you love this sweet corn pound cake recipe please consider giving it 5 stars. 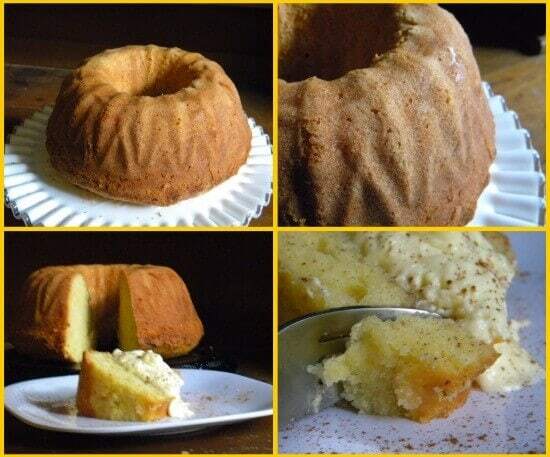 a delicately sweet, moist pound cake with just a touch of flavor from the corn. There is just no way to describe this... you'll have to make it for yourself. Break the cobs into several pieces. Add the corn and cobs to a large pot with buttermilk and cream. Bring to a boil, cover and remove from heat. Allow to infuse for one to two hours. Remove the cobs and puree the rest in a blender. Measure one cup of the corn milk mixture and set it aside. Beat the butter and the sugar until fluffy. Add the dry ingredients alternately with the corn milk mixture beginning and ending with the flour mixture. Spoon into the bundt pan and bake for 1 1/2 hours or until cake tests done. Cool 10 minutes in pan and remove to finish cooling on a rack. Cut and serve with a dollop of honey flavored whipped cream and a sprinkle of cinnamon. Beat the cream until thickened. Add the honey and sugar and continue beating until soft peaks form. The corn milk seems like a hassle. what about using creamed corn instead of the corn milk? The creamed corn would totally change the texture of the cake… and the recipe would fail because of too much heaviness and too much moisture. 🙂 I hope you like it. 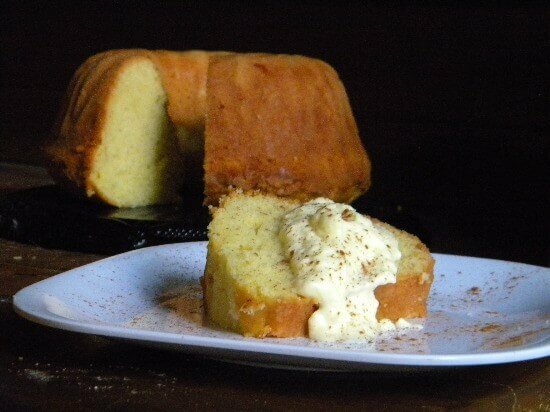 Love the idea of fresh corn in this pound cake. Can’t wait to try it! Wow…I would have never thought of using fresh corn for a pound cake. But I may have to try this dessert. I’m sure it would be a hit with my boys. Thanks for this ingenious recipe. Ali – it is so good. Mmm… gorgeous! This is just my kind of cake- from the buttermilk right down to the honey! I can’t even stand how good this looks! Pinning and totally making this SOON! Sounds fabulous, Marye! Where do you get full-fat buttermilk? I get mine at Tom Thumbs/Safeway.. it is hard to find because most stores have only the low fat/skim. Borden makes a full fate (whole) buttermilk. You can probably use the low fat one but I am just not convinced that the result is as good. I think you would like this Lee Ann.